It’s approaching midnight on a Saturday in January, and virtually every ArcTouch employee is still in the office. At this hour, though, no one is writing code or designing screens or building blockchain applications. It. Is. One. Big. Party. Music thumps loudly, shaking the foundation and rattling the rafters of the office building, located off to the side of a quiet highway on the Brazilian island of Florianópolis, about 300 miles south of São Paulo. Inside, night-club style lighting flashes to the beat. A deejay is busy up on the second floor, as team members, friends and family members below literally dance the night away. The party is the exclamation mark punctuating the end of a memorable three days. ArcTouch’s global team members, including mobile strategists, developers, designers, and operations, gathered for the company’s annual hackathon. Members of ArcTouch’s San Francisco-based app development team that made the trek are very much enjoying the after-hours event — eating, dancing, and laughing as the night slips into morning. It’s an enjoyable way for them to conclude the trip. But for the local team, this is just part of standard work-life. 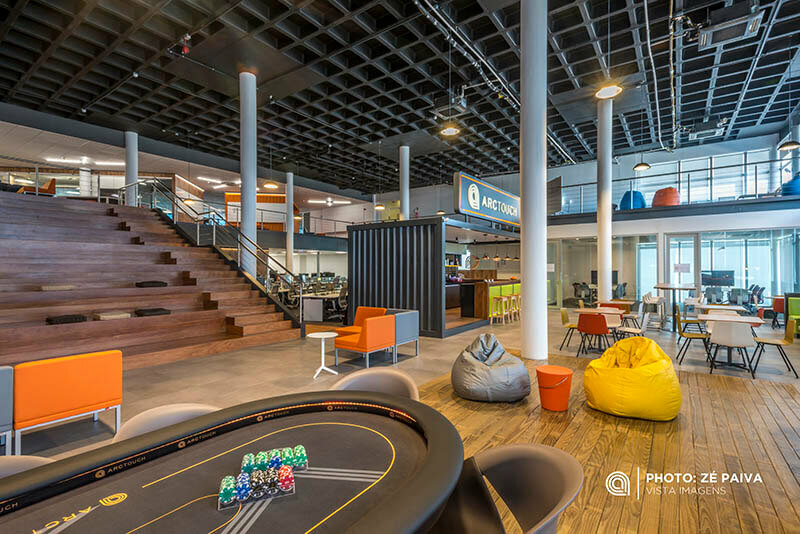 They often stay late in the office, eat and drink, play billiards or cards on the ArcTouch branded poker table, and get to know each other’s families. On this particular evening, the execution of the party itself and the office decor are reminiscent of startup culture in Silicon Valley — yet the vibe feels very different. One of the biggest challenges facing technology companies today is finding the right talent. For many, a fast and simple solution is outsourcing for temporary workers. But when Shapiro and his cofounder Adam Fingerman launched ArcTouch in 2009, the San Francisco-based entrepreneurs looked to Brazil to build a permanent team behind their app business. What they found was a hotbed of tech talent, along with a collaborative culture, entrepreneurial spirit, a favorable time zone – and a penchant for parties. Shortly after the introduction of the Apple’s original App Store, Shapiro and Fingerman were quick to hire Paulo Michels, now the executive vice president of engineering at ArcTouch, and a native Brazilian to join the company at the very start. With its multiple universities and tech incubators, Shapiro and Fingerman immediately recognized Florianópolis as fertile soil for fresh tech talent. It didn’t hurt that Michels, and his colleague Gustavo Chaurais (now an engineering manager at Apple), had worked with the two founders at a previous startup. There was a comfort level from the very start, as the four-person team spent long hours collaborating via Skype calls on proof-of-concept apps that would eventually help the startup land its first paying clients. Times have changed. Today, more than 150 mobile-specialized engineers, QA testers, and designers work at the Florianópolis office. And in the nearly 10 years since the company was founded, ArcTouch’s Florianópolis team has become, as some team members say, the “soul” of the company. So what made Florianópolis the perfect place for ArcTouch? For one, the city is a hotbed of engineering talent and activity. Florianópolis is home to 4000 companies and 16,500 employees in the tech sector. Every year, 40 IT companies are opened or migrate to the city. And over the past 20 years, two technological parks and seven incubators have been built in the city. It’s easy to understand why. With its tourists, sandy beaches and historical attractions, Florianópolis has a distinctly cosmopolitan vibe, making it an enviable location to work and run a business. And because of a robust talent pool that rivals what you’d find in Silicon Valley, Florianópolis offers the scalability ArcTouch needs to grow and adapt quickly – a win-win situation for employers and employees alike. Florianópolis didn’t just luck into its hi-tech talent pool. The city’s educational institutions, including the Universidade Federal de Santa Catarina (UFSC) and the Instituto Federal de Santa Catarina (IFSC), are known for their emphasis on hands-on learning and extensive lab work. This innovative approach to teaching has spawned a breed of IT professional that thrives on new experiences, thinks out of the box, questions the status quo and is eager to experiment. Life outside the office is also a key contributor to the Brazil team’s spirit of collaboration. Most people from Florianópolis would prefer to climb rocks than corporate ladders. The city’s culture revolves around outdoor activities, from jogging and surfing to playing soccer and hitting the gym. And sporting events, including triathlons, sailing regattas and pro surf tournaments, draw people together. ArcTouch’s chief of staff, Ross Buffington, got a first-hand taste of Brazilian generosity and inclusiveness when, shortly after he was hired, he visited Florianópolis four years ago. Cristiano Souza, ArcTouch Brazil’s general manager, threw a party at his family farm welcoming Buffington to the country. Professional cooks were brought in to prepare a traditional Brazilian BBQ while a botanical garden, chickens and peacocks provided the perfect backdrop. Other party staples included imported beer and ice cream. All of which makes Brazil an attractive place for an office. 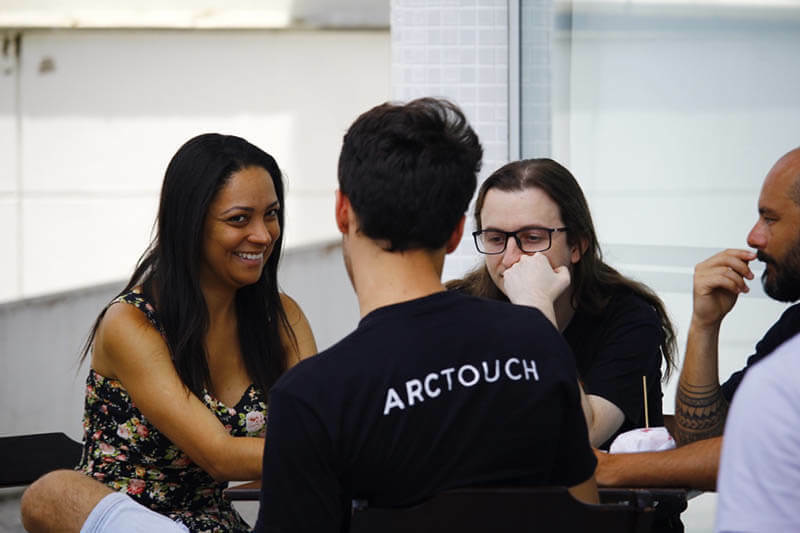 By creating a team in Brazil, and growing together as a unified company, ArcTouch offers employees opportunities to work in an agile fashion – a critical component in software design and development. And because Florianópolis is only four hours ahead of San Francisco (depending on the time of year), cross-border teams can work together in real time, alongside clients, to problem solve and provide the best customer service possible. Language issues aren’t an obstacle as most Brazilians are taught English at an early age. Even so, ArcTouch provides on-site English lessons to its team for those who need it as an employee perk. In addition to supporting real-time collaboration, having Brazilian and U.S. teams has served as a kind of cultural exchange program. The South American country’s culture of collaboration is woven into the fabric of the company. Thirsty Thursdays, a tradition started in Brazil, begins with a walk to the beer fridge but often spills over into local bars. Demo Days, also a Brazilian creation, encourages employees to stand up and talk about recent projects and innovations. Now, colleagues across the company and across borders chime into Demo Days via video conference once a month. And in San Francisco, fattening American fare has given way to an abundance of healthy snacks. “Brazilians are much healthier eaters than we are,” says Buffington. “They’re conscious of fitness and they’re conscious of eating well so we’ve had to start bringing in fresh fruit, yogurt and granola to satisfy their unique snacking style.” In fact, many employees in Brazil head to the gym first before arriving at the office at 10am. And many of Florianópolis’ outdoor parks feature gym equipment. Social and culinary influences aside, the Brazil team’s strongest impact on the company revolves around product design and innovation. 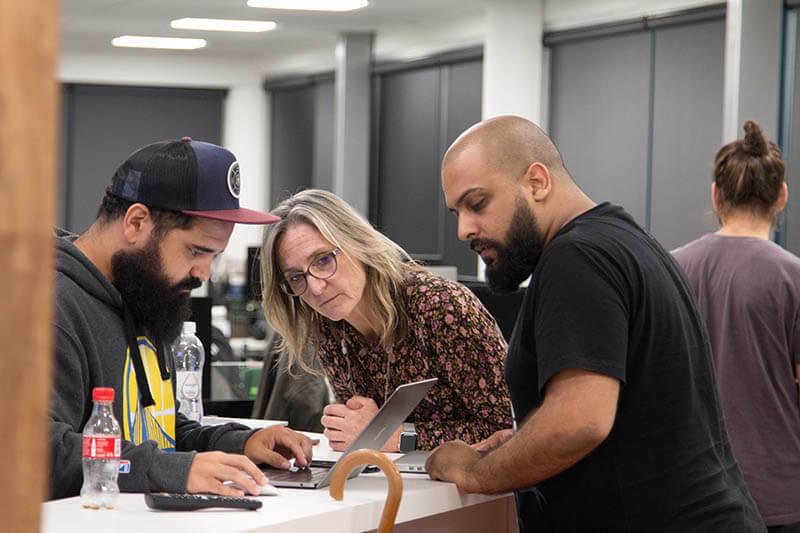 ArcTouch’s cultural exchange works both ways: the Brazil team is also reaping rewards from the company’s unique nearshoring arrangement. For Brazilians, ArcTouch provides the opportunity to work with high-profile U.S. based businesses, the latest tools and technologies, as well as acquire important communication skills. Others value the breadth of experience they’re able to acquire at ArcTouch Brasil. “Because of the work we do with top U.S. based companies, we can offer a lot more variety than IT professionals might get in other companies,” says Buffington, adding that it’s not uncommon for employees to work on 10 different projects at a time. 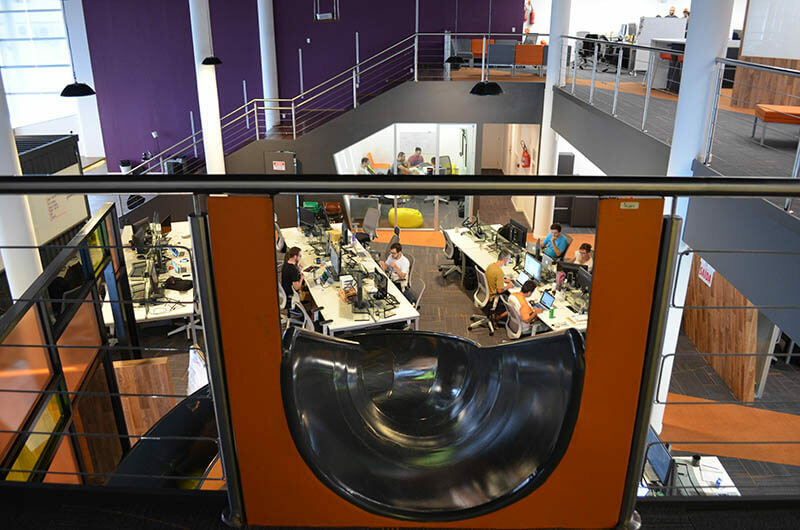 That opportunity — along with perks like the open, modern office space that is well suited to after-hours entertainment — has helped ArcTouch attract top local talent. By day, that talented team helps serve up mobile and connected experiences worthy of some of the world’s most important companies. And by night, hard work often transitions into play. Like the January evening and early morning after the company’s hackathon. When ArcTouch Brasil, the soul of the company, turned into One. Big. Party. Want to learn more about ArcTouch Brasil? Follow us on Facebook and visit our careers page.